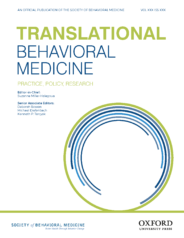 Translational Behavioral Medicine: Practice, Policy, Research (TBM) is an international peer-reviewed journal that offers continuous, online-first publication. TBM’s mission is to engage, inform, and catalyze dialogue between the research, practice, and policy communities about behavioral medicine. It aims to bring actionable science to practitioners and to prompt debate on policy issues that surround implementing the evidence. TBM’s vision is to lead the translation of behavioral science findings to improve patient and population outcomes. Half of Americans live with at least one chronic disease, such as diabetes, hypertension, or heart disease. Chronic diseases take an economic toll and account for a large proportion of health care costs. A moderate amount of weight loss and an increase in physical activity can prevent or reduce the burden of chronic disease. Therefore, we need to find a low-cost platform that is effective for chronic illness prevention. The use of digital technology, such as smartphones and mobile apps, has great potential to increase both adaptation and impact while decreasing cost. As the U.S. population is becoming more diverse, a “one size fits all” prevention program may not work for everyone. For example, Latinos are expected to make up 24% of the total U.S. population by 2065, up from 3.5% in 1960. Smartphone ownership among Latino Americans is extremely high when compared with other races/ethnicities in the United States. The Spanish-speaking population in the U.S. makes up the largest percentage of smartphone owners, who use their smartphones as their primary source of Internet and communication. Despite the rise in smartphone ownership and usage among Latino Americans, a limited number of studies have looked at the use of smartphone applications within the context of weight loss via reducing caloric intake and increasing physical activity among overweight Latino Americans at risk for type 2 diabetes. Our research team designed a study involving an in-person weight loss program in conjunction with commercially available inexpensive activity trackers and free apps for 54 Latino Americans. Although it was a small study conducted in the Bay Area of California, participants lost an average of 3.3% of their body weight and increased their activity to an additional 2000 steps (≈ one mile or 20 minutes brisk walking) per day from baseline over the 8-week study period. In addition to these improvements, researchers observed clinically significant reductions in blood pressure. Lower blood pressure is associated with a reduction in stroke mortality and a reduction in mortality from vascular causes in middle-aged populations. Although our study findings are promising, we do not know how long these participants will maintain their weight loss and activity level, or whether they will continue using the app and activity tracker after the study. In general, downloading a health app or wearing an activity tracker alone does not often lead to sustainable lifestyle changes. In fact, most people will stop using a downloaded app or wearing a tracker within a relatively short time period, and some people never even open these apps after downloading. Thus, the current challenges are how to use these digital technologies efficiently and effectively in a large population in a cost-effective manner. Rapid advances in technology, in particular artificial intelligence approaches, are creating new opportunities for prevention programs. Featured image credit: Silver Iphone 6 Near Blue and Silver Stethoscope by Negative Space. CC0 via Pexels. Yoshimi Fukuoka, PhD, RN, FAAN is a professor in the Department of Physiological Nursing and Institute for Health & Aging at the University of California, San Francisco. Julie Hooper BA, is a MPH/RD candidate in the department of nutrition at the UNC Gilling’s School of Global Public Health in Chapel Hill, NC. LinkedIn, Blog, Twitter.